With the new Doom Patrol by Gerard Way and Nick Derington for Young Animal/DC Comics making a splash, DC Comics has been reprinting the Grant Morrison run on the title that inspired in all manner of forms. But next year, they are going beyond that, for the run that saw Richard Case continue as artist, with writer Rachel Pollack, at the time the most prominent comics work written by a trans woman in the industry, both before and for many years after. Rachel’s run has never been collected before. But next year it will be. The strange misfit heroes of Doom Patrol must pull themselves together yet again as they move into a bizarre new headquarters, gain two new members and try to cope with the preteen menace called the Wild Girls! 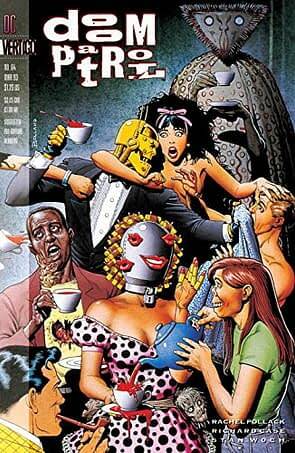 Writer Rachel Pollack continues Grant Morrison’s legendary series run in DOOM PATROL BOOK FOUR! Collects DOOM PATROL #64-74, DOOM PATROL ANNUAL #2 VERTIGO JAM #2.